STUNNING APPEARANCE: Macassar wood texture with high-gloss finish looks great on a desk or dresser. YOUR ENTIRE COLLECTION INSIDE: 4 winder rotors and 6 storage compartments provide for maximum usability in a compact size. FITS MOST WATCHES: Spring-loaded telescopic holders fit all watch bracelet and strap sizes. Can be used for both men’s and women’s watches. MAXIMUM COMPATIBILITY: 78 available winding programs provide compatibility for all watch models. LED BACKLIGHT: The watch winder has built-in LED light. The watches look especially beautiful in the dark. HIGH PRECISION WINDING: An electronic controller counts every turn of the watch to maintain supreme winding precision. SUPERB USABILITY: SPEED-WINDING mode allows full winding of а previously stopped watches. If NIGHT mode is activated, the winder stops operating for 12 hours and will not disturb you during the night. An automatic watch winder for 4 watches with 6 watches storage space, LCD didplsy and LED interior backlight by Paul Design. Please note: If your watch doesn't wind itself from wrist motion, it cannot be wound by an automatic watch winder. Watch winders are not compatible with Seiko Kinetic Watches because the watch mechanism is not the same as in traditional automatic movement watches. Please note: Watch winding mode (winding direction and TPD setting) depends on your watch model. Check your watch owner's manual or contact your watch brand customer service for detailed information. The AC adaptor is packed separately with the product or is located in the storage drawer. After you plug it in, turn the device on with the button on the rear panel. The watch winder is equipped with rotor position sensors. Each rotor stops at 12 o’clock position for a better watch display. When plug-in the power cable the first time, the rotors will start moving to initialize the sensors. 1. The rotary speed of watch winder is approximately 9 to 10 rotations per minute. The rotations number is controlled by an electronic counter. 2. "SLEEP" mode: If "Sleep mode" is activated, the winder works for 12 hours and then rests for 12 hours. The number of rotations is automatically doubled to provide the same number of rotations to the watches. 3. "SPEED-WINDING" mode: conduct speed winding of the watches that have stopped. The rotation is set at 480 turns in both directions (240 turns for clockwise, 240 turns for counterclockwise). After speed-winding is activated each time, it will return the programmed setup after 480 turns are completed. 4. Program adjustment(s): watch winder can be set with "RPH" (rotations per hour), rated from 22 to 76 revolutions per hour. Under "sleep mode", the number of rotations is automatically doubled during 12 hours working period. If your watch specification shows the required winding cycle in TPD (turns per day), you can convert it to RPH dividing by 24. For example: 1200 TPD / 24 = 50 RPH. (1200 turns per day divided by 24 hours is equal to 50 rotations per hour). 5. Watch winding mode (winding direction and Rotations-Per-Day setting) depends on watch model. Check the user manual or contact watch brand customer service for detailed information. 6. Press any button to turn the winder ON. Press "OK" for 5 seconds to turn the winder OFF. 7. Press "OK" shortly to pause for 5 minutes. If the rotor was moving, it will stop in 12 o’clock position. Please wait, until the rotor comes to a complete stop. It might take up to 8 seconds. The watch holders can be placed or removed only when rotors are stopped. This prevents breakdown of the winding mechanism when you fix a watch holder onto a rotor or take it out. 2. START / STOP: Displays ► during operation, ◼ during stoppages, ▷ during pause. 3. R.P.H. : Displays number of Rotations Per Hour from 22 to 76, increasing or decreasing in even numbers. 4. DIRECTION: Clockwise winding, counterclockwise winding or mixed mode (clockwise + counterclockwise winding). 5. SLEEP: Displays "OFF", or 1 to 12. OFF is displayed if the "Sleep mode" is not activated. The numbers represent a delay (in hours) before the winder enters "Sleep mode" for a 12 hours period. 6. SPEED WINDING: OFF or ON. The display fluorescence will disappear in 2 minutes after the last operation or input is completed. Pressing any button will reactivate the display fluorescence. 1. Connect the power supply. 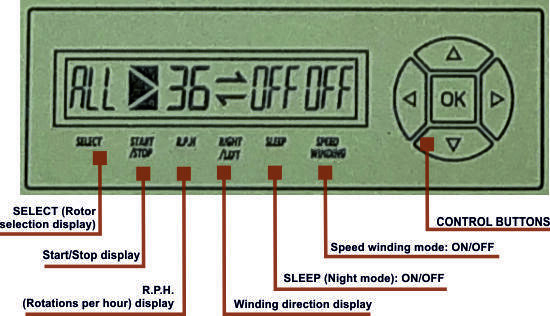 The default setting is 36 RPH (rotations per hour), both directions, for all winder rotors. 3. Confirm selected target. Press OK button to confirm your selection. The selected target's flashing frequency will turn slow. 4. Adjust the settings pressing ▲ or ▼ buttons. 5. Press and hold OK button for 3 seconds to save the setting. The setting target will stop flashing. 6. Repeat the above mentioned steps to set other parameters. 7. After you set-up all winder rotors, activate watch winder. Choose START in the START/STOP option. Display ◼ turns into ►. The company specializing in manufacturing watch winders under Paul Design brand was founded by a leading technical expert, Paul Chen, who worked with such brands as Buben & Zörweg, Swiss Kubik and Elma. The company’s mission is to combine modern Swiss technologies, reliable mechanisms and premium luxury materials. However, the product prices are quite affordable due to the fact that production is based in Hong kong. This product line includes models both with or without additional compartment for watch storage. A new function “speed winding” makes it possible to wind up watch in a very short time. With “sleep mode”, you can switch the winding cycle to daytime mode. All boxes from this product line are supplied with a remote control device. Models from this product line are produced in 6 different colors: carbon, macassar, white, black, dark burl, walnut. You may select boxes for one, two, four or eight watches. The model does not have a front door, which makes it convenient for embedding it into the furniture systems or safes. Moreover, you can use not only a network adapter, but also a rechargeable battery as a source of power supply. All boxes are equipped with electronic control panels with touchscreen, which makes it possible to accurately and conveniently establish a required winding mode. Watch-winder.Store is an exclusive dealer of Paul Design products in the USA.